Flora Al Barsha Dubai is a four star deluxe hotel located in the heart of Dubai's business and leisure district in Al Barsha, dedicated to provide quality guest services while minimizing their impact on the environment.Flora Al Barsha Mall of the Emirates believes in responsible and cultural based eco - tourism and provides the assurance that its first class facilities have met environmental best practice standards. 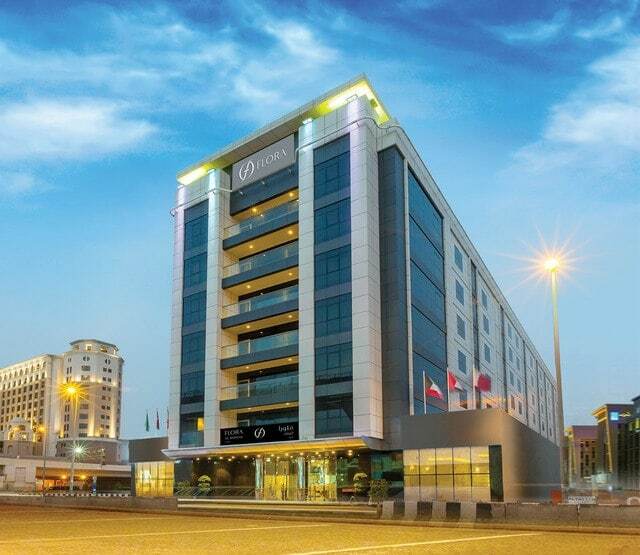 Flora Al Barsha Mall of the Emirates offers 186 fully serviced and spacious guest rooms, designed to pamper you with comfort and meet your everyday needs. The guest rooms, with soothing warm colors, contemporary furnishings and lighting, as well as modern interiors, are designed to provide you with an exclusive luxury experience and meet the highest expectations of travelers. Flora Al Barsha offers 186 fully serviced and spacious guest rooms, designed to meet your everyday needs. The guest rooms, with soothing warm colors, contemporary furnishings and lighting, as well as modern interiors, are designed to provide you with a maximum comfort and an exclusive luxury experience, Including Classic, Deluxe and Premiere Rooms, as well as 12 executive suites designed to meet the highest standards of both leisure and business travelers. Spacious and luxurious rooms, elegantly designed for a maximum comfort measuring 35sqm. The rooms come with luxurious furniture, including king or twin beds, 46” screen TV and fully equipped bathrooms. Elegantly designed rooms with luxurious furnishing and relaxed design measuring 40sqm, including king or twin beds, 46” screen TV, fully equipped bathrooms with well stuffed amenities. Spacious, bright and Luxurious rooms measuring 45 sqm with 46" television. The rooms come with king or twin beds, modern, fully equipped bathroom with shower cubicle and Tub and well stuffed amenities. Spacious & elegant suite measuring 75 sqm with a comfortable space for seating and dining with 46" television in living room and bedroom. The rooms come with king or twin beds, fully equipped bathrooms with shower cubicle and Tub. This Spacious Premiere Connecting Room features 80 square metre of space with 46" full HD smart TV and Free Hi Speed Wi-Fi access for unlimited devices, connecting a Premiere Room and a Classic Room. The rooms come with luxurious furniture including king and twin beds and two fully equipped bathrooms with well stuffed amenities. This Spacious Two Bed Room Deluxe Suite features 115 square metre of space. Furnished with luxurious taste, this suite connects an Executive Suite and a Deluxe Room and is ideal for family travel in Dubai. Featuring a relaxing living room with a separate dining space and is equipped with every comfort; including king and twin beds, 46" full HD smart TV, Free Hi Speed Wi-Fi access for unlimited devices, two fully equipped bathrooms with shower cubicle and Tub, as well as an additional guest wash room. Flora Al Barsha offers a selection of authentic cuisines and delicious dining options. Enjoy a wide array of aromas and delights in our daily international buffet breakfast, lunch and dinner along with A la Carte options available throughout the day. The Flora Al Barsha is an elegant and welcoming restaurant with a unique style in keeping with the stylishly modern décor with 120 seats on board. We aim to create a divine meal experience for all foodies. We offer Indian and Continental Cuisine with daily International Buffets for Breakfast, lunch & Dinner. The restaurant is perfect for the dining and celebrations of all kinds. Proud to be Australia’s most successful coffee retail brand. A belief in sourcing the very best coffee and using only fresh locally sourced ingredients. A 24 hour coffee shop with a wide range of premium coffees and a Ala Carte menu of exquisite pastries and sandwiches. Why choose Flora Al Barsha Mall of the Emirates Meetings And Event Space? Flora Al Barsha offers a range of superb facilities for guests, including state of the art Techno Gym cardiovascular apparatus, resistance machines and free weights. The hotel has a Serenity Spa and Wellness centre. A wonderful range of massage treatments available all using natural organic blends of oils. We offer Spa Treatment rooms, swimming pool, exercise studio, steam, sauna and Jacuzzi. Flora Al Barsha features a world-class Fitness Center, fitted with state of the art Techno Gym cardiovascular apparatus, resistance machines and free weights. Memberships are open for 1 month, 3 months, 6 months, 1 year and corporate rate is available for a minimum of 5 people. Drive to the airport exit road and follow the directions to Jebel Ali and Abu Dhabi sign along Sheikh Zayed Road. Take Exit 39 (interchange 4) and follow sign of Mall of The Emirates. Keep left to come down to service lane, Drive another 400 meters you are in front of "Flora Al Barsha Hotel" to your left. Keep left to the fork which would lead to service lane.